Come build cool things and learn new skills at Tam Makers! 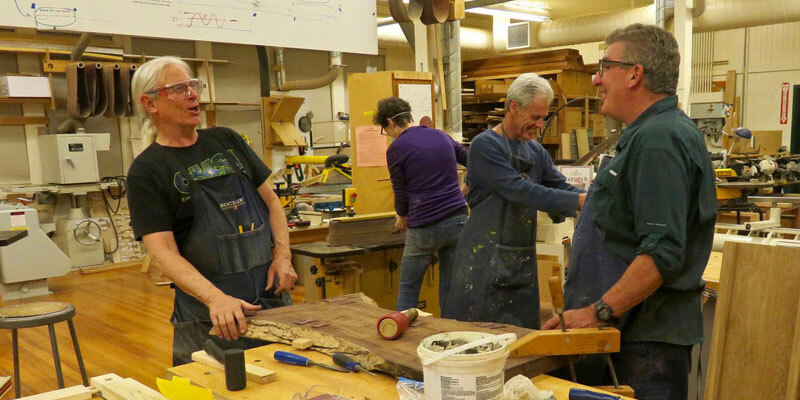 This fall, we have a great lineup of maker and woodworking classes for you. Course topics range from electronics to laser cutting, hand tools, maker art, wood turning and building an elegant box. • Wednesdays 6-9pm: You Can Make It (no loud tools) – NEW! • CNC Router – Sep. 27 – Oct. 4 – NEW! • Create an Illuminated Wonderbox – Oct. 26 – Nov. 9 – NEW! • Maker Art: Create a Haunted House – Sep. 28 – Nov. 16 – NEW! Students will build magical worlds with ghosts, witches and other animated creatures — and bring them to life with lights, sounds and motion. Learn more about these and other fall courses in our Classes page. Be sure to sign up early, before they fill up! Most classes start at 6pm (except for the youth classes, which start at 3:30pm.) All classes and meetups take place in our new makerspace at Tamalpais High School: 700 Miller Ave, Mill Valley, CA 94941. See map. We invite you to join our next meetup this Wednesday, August 24, from 6 to 9pm. It’s fun, free and a great way to meet some of the creative makers in our community! We’ll start at 6pm with tours of our makerspace and demos by community members (you’re welcome to bring and show off your own maker projects). At 6:30pm, we will talk about our fall classes, volunteering and next steps for Tam Makers. At 7:30pm, we will make something fun together and plan a community project for Halloween. If you plan to come, please RSVP here. Next month’s meetup will be on a Friday, September 23, from 6 to 9pm. If you missed our last meetups, here are the photos, slides and video. 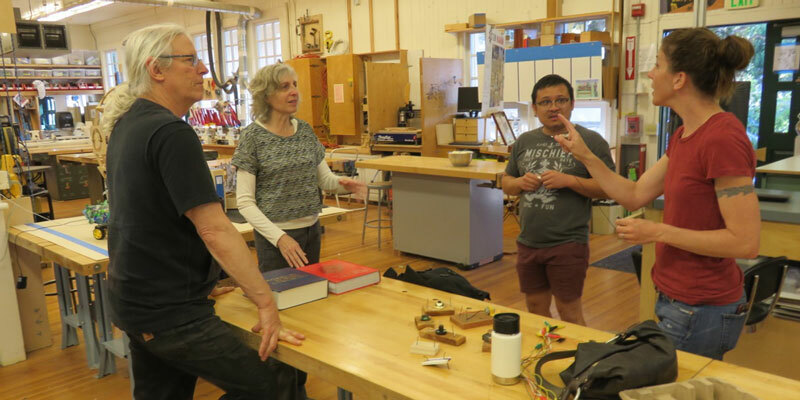 To learn what our community thinks of Tam Makers, we ran an online survey from June 9 to August 6, 2016, asking a variety of questions about their interests and our maker programs. All respondents are interested in Tam Makers. Most want to use the makerspace (87%). Most are interested in adult classes (83%). 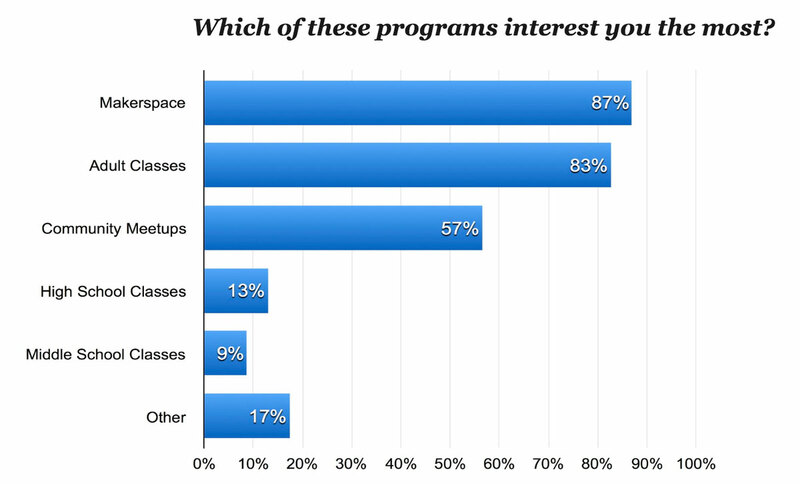 Many want community meetups (57%). Many would consider paying a membership fee (58%). Some are prepared to volunteer for Tam Makers (50%). Some parents are interested in our youth programs (35%). For more results, read our survey overview (or the full report). Many thanks to all community members who took the time to share your feedback! We really appreciate your insights, which will help inform our plans for Tam Makers. We hope to see you at next week’s meetup to discuss all this in person. For now, we invite you to sign up for classes that interest you — and spread the word in your community.